Several NFFE-IAM locals hit a grand slam recently when five members took the field before a Baltimore Orioles home game. 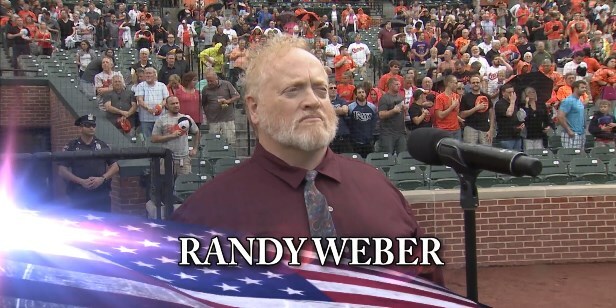 One of them, NFFE-IAM Local 178 member Randy Weber, stood in front of the Camden Yards crowd to sing the national anthem. NFFE-IAM Local 178 member Randy Weber prepares to sing the national anthem before a Baltimore Orioles home game as part of AFL-CIO night at the ballpark. NFFE-IAM members received awards on behalf of their locals for selling over 300 tickets each to support the Baltimore Orioles’ AFL-CIO night. From left: J.T. Rosenberger, Local 175; Carol Helfrich, Local 1784; Lisa Foust, Local 178; and Warren Glenn, Local 846. Representatives from four IAM Locals were honored on the field before the game: J.T. 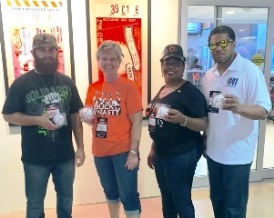 Rosenberger of Local 175, Carol Helfrich of Local 1748, Lisa Foust of NFFE-IAM Local 178 and Warren Glenn of Local 846 received Orioles Heavy Hitter Awards on behalf of their locals for selling over 300 tickets each to support the ballpark’s AFL-CIO Night. A portion of the ticket sales support the AFL-CIO Metropolitan Baltimore Council food pantry and community services projects. Weber returned to the field for the seventh inning stretch and delivered his rendition of “This Land is Your Land.” Watch the video.